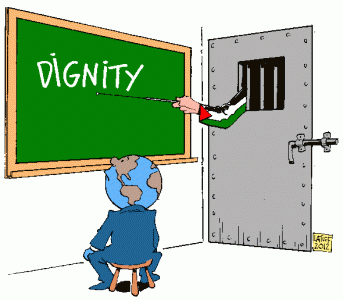 Palestinians In Israeli Occupation Prisons: Update and Take Action! Browse: Home » 2014 » August » Palestinians In Israeli Occupation Prisons: Update and Take Action! On the second day of the new school year, Israeli occupation army kidnapped 15-year-old Deir Istiya resident Mohammed Abdelrahim Zedan as he was coming back home from school. He was sent to Huwara interrogation/detention centre. In August alone, 19 people were kidnapped by the Israeli army from Deir Istiya, a beautiful village that warmly hosts IWPS teams on the ground. The treatment of child prisoners in Israeli occupation jails systematically violates their basic rights as children and as human beings. On Sunday 24th August – the first day of the school year – heavily armed “special units” of Israeli occupation prison guards raided the child prisoners’ wing in Hasharon prison. They physically searched the children and made them stand outside in their underwear for several hours, in the night; ransacked five rooms; and tore up the children’s pillows and blankets, replacements of which will have to be bought by the prisoners themselves. Members of the Palestinian Legislative Council are also a target. Currently 37 PLC members are imprisoned; most are held under ‘administrative detention’, i.e. without any charges. The most recent case of intimidation and harassment is that of PLC member and prisoners rights advocate Khalida Jarrar, who was given an expulsion to Jericho order by the Israeli occupation army after it ransacked her Ramallah home. Jarrar refused to obey and is now working from a solidarity tent in Ramallah. Deprivation of family visits under security pretexts is a common tactic to intimidate Palestinian prisoners. From the start of Israel’s war on Gaza, prisoners from Gaza have been denied family and often lawyer visits. Such punishment is also applied to Palestinians from the West Bank: Muna Qudan, from Jenin, was kidnapped by the Israeli army in November 2012 and has not been allowed to see her family since; her brother and fiance, too, are held in Israeli occupation jails, reports UFree Network. Denial of medical treatment is yet another way to make Palestinians in Israeli dungeons suffer even more. Those injured by the army before their kidnap are often denied even the most basic medical check-up upon arrival at prison; the needs of prisoners with serious health conditions are almost never met. Hundreds of Palestinians are being kidnapped and incarcerated every week in the Palestinian territory of the West Bank. Violent night raids are still the most common way, despite strong condemnation of such practices by local and international human rights organizations. The kidnap campaign intensified since the disappearance of the three illegal Israeli settlers on 12 June in what accounted to collective punishment, which is considered a war crime under international law. The Israeli military court system to which Palestinians are subjected also aims to aide the ethnic cleansing of Al Quds [Jerusalem]. The Palestinian Prisoners Club reported that since June, around 700 Palestinians from Jerusalem have been kidnapped by Israeli police, including 200 minors. In some cases, apart from the NIS 500-10,000 bail, Palestinians have been ordered to pay fines of up to NIS 1,000,000. If they are unable to collect such large amounts of money, the state of Israel will take their family property (housing and/or land in Jerusalem).